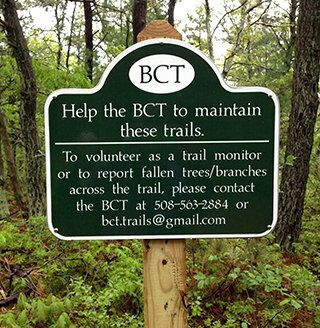 Bourne Conservation Trust expects visitors to exercise common courtesy when using the trails. Special attributes of BCT properties are the human scale, the convenience to nearby residential areas and the intimate weaving of nature with settlement that is BCT's primary objective. By definition, this means you will be close to private properties and homes. Please stick to the trails, be sure your canine friend does too, and remember to scoop the poop. Don't mar the natural beauty with motorized vehicles, hunting, fires or litter. Listen to the birds, smell the flowers, drink in the views, enjoy the serenity and be thankful there are still havens like this in a busy world.